In Autumn, 2000, there began 23 new BS digital high vision programs from 10 broadcasting stations in Japan. 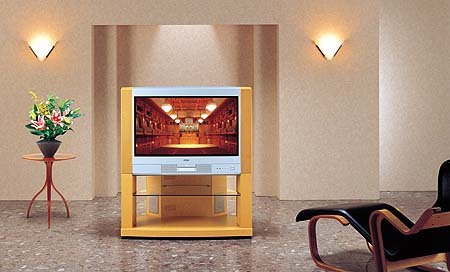 At once, manufacturers presented new TV models and positively advertized their features. Today, technical revolution of the communication system is rapidly changing our daily life, which is represented by mobile phone, personal computer, and BS digital high vision program. At home and office, we are much interested in BS digital high vision TV that enables us not only to view the newest visual image but to enjoy an intercommunicative life, still, because it is quite an good product, we spend much time to make our choice. In such a situation, "VIZON" is sophisticated enough so that we can concentrate to view the wonderful visual image without being bothered by the high technology design. The large monitor is held by bright colored woodlike simple pillars which harmonize with the interior. The aim "to own one's private theater" is realized in this manner.